Direct drive blower is statically and dynamically balanced for quiet operation and specially mounted in the unit for reduced vibration and noise. Heavy steel cabinet provides strength for quiet, rattle-resistant operation. Heat exchanger constructed of durable 409 stainless steel. Limited lifetime warranty on heat exchanger and recuperator coil. Warranty can be further enhanced by asking for the Amana AsureTM extended service plan. Ask your Amana dealer for details. Building on our industry-leading condensing furnace technology, the model 355MAV is our greatest innovation in comfort control and operating efficiency. Modern technology provides the Plus 90i design with great reliability, high efficiency, and ultra-quiet operation. Efficiencies are up to 96.6% Annual Fuel Utilization Efficiency (AFUE). The model 355MAV Plus 90i Condensing Gas-Fired Furnace incorporates the electronic intelligence of a microprocessor. The microprocessor control center interacts with a 2-stage gas valve, a variable-speed inducer motor, and a variable-speed blower motor, allowing the Plus 90i to adjust combustion air, firing rate, and airflow to maintain peak efficiency throughout the operating cycle. The variable-capacity system provides the ultimate in heating comfort while minimizing electrical and gas consumption. Limited Lifetime Warranty on the heat exchangers for the lifetime of the original owner in a single family residence; 20 years in other residential and commercial applications. Contact your dealer for details. Five-year Warranty on microprocessor control, variable speed motors, and a three-year Warranty on hot surface ignitor. Combination Home Heating and Hot Water. It's Not Just Heat...It's CompleteHeat! There are few things more basic to your comfort than indoor heat and hot water. And now, Lennox can make sure you always have plenty of both with the CompleteHeat system. 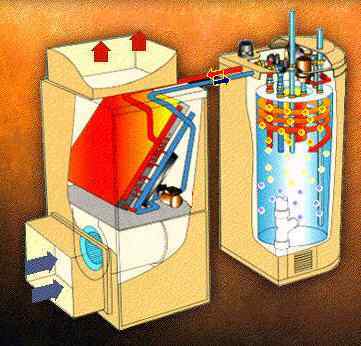 The system, which consists of a heating module and air handling module, works like a furnace and water heater. Together they provide high-efficiency home and water heating with virtually unlimited hot water. Now, no matter how large your family is, you'll enjoy comfortable heat throughout your home and hot water on demand! It's a concept so innovative and yet so simple, it could only have come from Lennox! Our unique heat exchanger design is one big reason why the CompleteHeat system can deliver a constant, reliable supply of hot water and comfortable heat through your home. But it's only the beginning. We also engineered the system with a smaller, 30-gallon water storage tank, versus the typical 40-gallon tank. The smaller size means quicker heating with less standby heat loss. Combined with Lennox' exclusive comfort control technology, it produces three to four times more hot water than a conventional water heater! The chart below shows that a CompleteHeat high capacity system can keep up with a steady usage of 3 gallons of 120 degree F (40 C) hot water per minute and never run out! (An average shower head discharges only 2.5 gallons (9 liters) per minute of mixed hot and cold water.) An ordinary water heater, on the other hand, starts to run out of hot water after only ten minutes and after 15 minutes, the water isn't hot at all! Keeping your home warm and comfortable during cold winter months and having lots of hot water is important. But no less important is the desire to save money! Every facet of the system is engineered to make the most of your energy dollar (to the tune of a 90% Combined Annual Efficiency (CAE) rating). That's efficiency you'll see every month in lower utility bills! * CAE (Combined Annual Efficiency) is a measure of the amount of heat produced for every dollar of fuel consumed for both home heating and water heating. At Lennox, our products are as good as our word. That's why the heat exchanger and water storage tank are backed by a 15-year limited warranty (compared to five years on most water heaters). All remaining components of the CompleteHeat system are backed by a 5-year limited warranty. Thanks to Lennox' exclusive comfort control technology, innovative water tank and heat exchanger design, you can count on getting warm, comfortable air throughout your home and hot water whenever you need it. CompleteHeat can be installed as a forced air comfort system or integrated with infloor radiant heating. Traditionally independent of each other, these similar systems often duplicate a variety of functions. But not anymore. Heating industry innovators, Infloor and Lennox, have combined all these functions into a single, high-efficiency system - the kind of system you'll wish someone had thought of years ago. The two compact units can be installed just about anywhere in upflow, downflow or horizontal applications, either side-by-side or separated. PVC pipe venting is easily installed. You may actually gain floor space if you're replacing older units! Lennox has the right-size system to fit your home's heating needs. The efficient CompleteHeat system, delivers more heat for your energy dollar and runs on clean, economical natural gas. The CompleteHeat system can be adapted to a wide range of applications, including radiant floor heating. With an optional kit, it's easily converted to LP gas. The sealed combustion design uses 100% outside air to operate the burner. No exposed flames for either home or hot water heating means safer, more reliable worry-free operation. Vent blockage protection, redundant gas valve, temperature/pressure safety valve and high temperature limit work together to ensure safe operation for the life of the system. A smaller-than-normal (30 gallon) stainless steel water tank speeds water heating and minimizes standby heat loss. Together with Lennox' innovative heat exchanger, it produces a dependable and abundant supply of hot water. Air flow and water temperatures can be adjusted to satisfy your comfort preference. Water settings range from 120 to 140 degrees F (40 to 60 degrees C). Your Lennox dealer can adjust your system to an even higher water temperature setting, if desired. The CompleteHeat system is built to last. The water storage tank, heat exchanger and burner are all made of high-grade stainless steel for longer operating life. A durable, baked-on enamel finish protects the cabinet against rust and corrosion. A quiet burner and insulated blower cabinet make this one of the quietest high-efficiency heating systems available. No matter where it's installed , you'll hardly know it's there. The high-efficiency, reusable air filter is easy to get to and easy to clean. The CompleteHeat system consists of two modules, a heating module that produces heat and an air handling module that sends warmed air through your home's heating ducts. The process begins when water fills the water storage tank through the pipe at the top of the heating module. When heat is needed to warm your indoor air and water, the heating module tells the combustion blower to draw in outside air which is used for combustion. This means the system doesn't waste your home's conditioned air. After a short safety delay, a fuel mixture is sent into the burner where it's ignited by electronic spark. The ignited fuel is super-hot and as it moves through the stainless steel coil within the water storage tank, the water in the tank is heated to 120 degrees F (49 C) or your preferred temperature. After the combustion products have traveled all the way down through the coil in the tank, condensate (water) is separated and drained, and exhaust gases are vented safely out the top of the unit and on through the PVC piping to the outdoors. Hot water is directed to your faucets through plumbing at the top of the heating module. The same fuel that heats your water also heats your indoor air. When your homes thermostat senses a need for heat, a small water circulating pump draws hot water from the heating module and sends it through the space heating coil in the air handling module. The hot water in the coil warms the surrounding air. The blower turns on only after the coil has been heated and warmed air is then sent through the air duct system into the rooms of your home. Water is continually reciruclated back into the heating module to be reheated until your home reaches your desired comfort level. Each step in the CompleteHeat process works toward making your home more comfortable and energy efficient, and providing more hot water than ever before. What is Lennox CompleteHeat system? CompleteHeat is a highly efficient combination system for heating air and water in homes using either natural gas or propane as fuel. The unit consists of two components. The Heating Module (HM30) consists of a high grade stainless steel burner, heat exchanger and 30 gallon water storage tank. The Air Handling Module (AM30) replaces the conventional furnace and contains a copper tube, aluminum fin heating coil and a water circulating pump. The user selects the temperature of the water held in the storage tank. As hot water exits, cold replacement water enters the bottom of the tank. A thermistor mounted on the tank's side senses when the hot water supply is significantly depleted and the burner ignites to re-heat the water in the tank. A Room thermostat senses changes in temperature and energizes the control system in the AM30 air handling unit. When the room thermostat calls for heating, the system's pump immediately begins circulating hot water from the storage tank through a heating coil in the air handling module. A time-delay circuit controls the circulating air blower to ensure air is fully heated before it enters the duct work. When the thermostat senses the space has reached the desired temperature, the pump stops circulating hot water and, after a 30-second delay, the circulating air blower shuts off. For cooling, AM30 controls operate the circulating air blower and air-conditioning system in the same manner as a standard furnace. How does CompleteHeat exclusive comfort control technology benefit the homeowner? This unique design feature combines advanced electronics with a water storage circulator to deliver hotter water to the air handling module. This results in warmer discharge air temperatures than most conventional high-efficiency gas furnaces. Can the CompleteHeat system heat air and water simultaneously? Yes. The system's high heat input design insures the amount of energy supplied is adequate to simultaneously heat air and water provided the unit installed in the home is properly sized to fit the application. If there is an unusually high demand for heating, water heating has priority. Why is the CompleteHeat system so quiet? Lennox engineers employed the same sound reduction techniques that have proved so successful with their other furnace systems, including fully insulated cabinets and super quiet blowers. CompleteHeat features a totally sealed combustion system and its submerged heat exchanger muffles even the small noises generated in the combustion process. What happens to the water left in the space heating coil during the summer months? CompleteHeat circulates the this water through the tank and heating coil for a short period of time four times per day to ensure water does not lie on in the system for protracted periods of time and to prevent the accumulation of mineral deposits. Intermittent circulation occurs only when air conditioning is not operating. Can air conditioning be added to the CompleteHeat systems? Yes. The system is engineered to work with Lennox air conditioning coils and condensing units. Upflow and downfllow cooling coils fit directly on the supply air side of the air handling module and operate with standard duct work connections. A short transition duct is required for horizontal installations., On the return side, air ducts connect directly to the cabinet or the external filter rack supplied with the unit. Can the CompleteHeat system heat water without adversely affecting the performance of air conditioning? Absolutely. The system is designed to insure no heat gain from the coil is introduced into the air circulation system when it is in the cooling mode. Additionally, CompleteHeat deliver a superior airflow of 400 cfm per ton during the cooling operation. Why only a 30-gallon storage tank? CompleteHeat needs only a 30-gallon storage tank because it is designed as a high heat input system which can replenish its hot water supply in a fraction of the time required by conventional water heater. The small tank improves efficiency by reducing stand by heat loss and allows for a compact installation. How does the CompleteHeat system provide a virtually unlimited hot water supply? Conventional water heating systems rely on relatively low BTU heat input coupled with larger storage tanks to maintain an adequate supply of hot water. The disadvantage of this method of water heating is that it requires significant recovery time to replenish its reservoir of hot water. High heat inputs and fast recovery, combined with Lennox exclusive comfort control technology, ensures a nearly constant supply of hot water (120 to 140 F) even during periods of peak demand. CompleteHeat has a Combined Annual Efficiency (CAE) rating of 90%. What does that mean to the homeowner? CAE for combined efficiency, AFUE for home heating and Energy Factor for water heating. CompleteHeat ranks among the most efficient systems in each of these separate rating systems. How is the CompleteHeat system converted for use with LP gas? Your Lennox dealer can make the switch from natural gas to propane, simply no problem. Why is it important to note CompleteHeat uses 100% outdoor air for combustion? There are several reasons. Overall heat loss inside the house is reduced because it is not necessary to send indoor air through the combustion process. Outdoor air contains far fewer contaminants so using it ensures the integrity of the air supply and prolongs the life of the system's high-efficiency heat exchanger and burner. Finally, this method of combustion means CompleteHeat can be installed in very tight, energy efficient homes without experiencing any operational or safety problems. What safety features are built into CompleteHeat? CompleteHeat is inherently safer than conventional furnaces and water heaters because it has a completely sealed combustion system, which means there is no open flame. CompleteHeat's flame rectification circuit closely monitors the combustion process while the system's multi-retry and WatchGuard circuit insure prompt resumption of combustion following any temporary interruption in the gas supply. In addition the CompleteHeat features high temperature protection, vent blockage protection and standard pressure/temperature relief valve on the water storage tank. Is CompleteHeat easy to service? Design of the CompleteHeat system was a collaborative effort by Lennox engineers, manufacturing personnel, service technicians, and dealers. The group placed special emphasis on easy service which resulted in many substantial improvements over conventional equipment. For example, the combustion air blower, burner and pressure switch are all located at the top of the HM30 module, which means the service technician can stand while maintaining the unit. Solid state control boards in both the air and heat modules contain diagnostic LEDs to insure problems can be easily identified. Even the system's circulating pumps are designed with removable cartridges so that internal parts can be replaced without removing the pump body from the piping system. What are some of the applications for the CompleteHeat system? CompleteHeat systems provide space and water heating for residences, multi-family housing units and commercial establishments. The system is easily adaptable to zone heating with the installation of multiple AM30 units or a radiant floor heating loop in parallel with the AM30 unit. The air handling unit can be installed in upflow, downflow or left/right horizontal positions. Because the HM30 unit is design certified by AGA and CGA, it can be used as a stand-alone water heater in applications requiring high efficiency and large amounts of hot water. How does CompleteHeat differ from other combination heating systems? All components are designed, manufactured and supplied by Lennox to insure uniformity, easy installation and superior performance. As a result. CompleteHeat contains many operating features not available in assembled systems. These include a 90 percent Combined Annual Efficiency rating, a two-stage burner that insures maximum efficiency and four times faster heating capacity over conventional water heaters, and electronic controls that assign priority to hot water heating, periodically circulate water through the system and maximize warm air comfort. How do building code officials view this revolutionary new heating system? All national model codes - SBCCI, Uniform Plumbing Code, the BOCA National Plumbing Code and the National Mechanical Code -- allow the installation of combination heating systems. The most important thing to note is the CompleteHeat is certified by the American Gas Association and designed and built according to rigorous industry standards. Does water quality effect the CompleteHeat system? Normally, no. Lennox uses the highest quality materials, including stainless steel and brass, in its CompleteHeat system. Additionally, the circulating action of the system combined with the top-mounted burner and heat exchanger dramatically reduce the effects of hard water. However, in regions where the water supply is extremely hard or contains impurities that affect taste, it may be desirable to install any water conditioning or filtering equipment considered standard for residential installations in these areas. Why should a homeowner consider purchasing the CompleteHeat system? When a major appliance like a heating furnace or a water heater nears the end of its life cycle, often the other piece of equipment is not far behind. Replacing both units at the same time has benefits such as eliminating the costly vent system modifications necessary in some replacement installations. In large homes or homes requiring lots of hot water, a virtually unlimited hot water supply will be a much appreciated bonus. Additionally, the high efficiency performance of the CompleteHeat can significantly reduce energy costs. Conversions from electricity to natural or propane gas can result in even greater savings for both home and water heating. CompleteHeat's simple venting procedures make these conversions easier than ever. How durable is the CompleteHeat system? Lennox's award-winning quality controls procedures and ISO 9000 international standards ensure unsurpassed attention to detail. The use of highest quality materials and most advanced processes for fabricating and joining materials, together with extensive durability and field testing, make it possible to offer one of the best warranties in the industry. Both the heat exchanger and the storage tank in the CompleteHeat are backed by a 15-year limited warranty while most other components are backed by a five year-limited warranty.